Over the weekend, I headed over to Governor's Island for the first time to check out the free annual imaginative art-and-play festival FIGMENT NYC. The island is only open to the public from May 27 to September 25 and for one silly weekend people gather for all sorts of shenanigans. There were musicians, crazy costumes, giant bubbles, a mini-golf course, foam sword fighting and a bunch of curious artwork we really couldn't quite figure out. 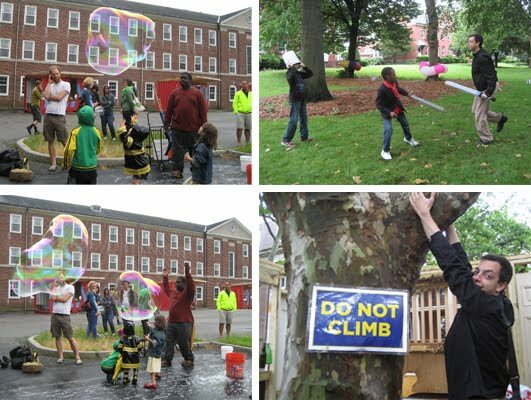 It was great seeing that not only kids were completely amused by the simple things, but that the adults were having just as much fun. Had I known beforehand, I totally would've busted out a colorful mismatched costume, too. Maybe next year? One of my favorite art installations was a small replica of a subway train interior. This was the only time I've been able to grab the overhead pole and have my feet still touch the floor so obviously I had to capture that special moment. 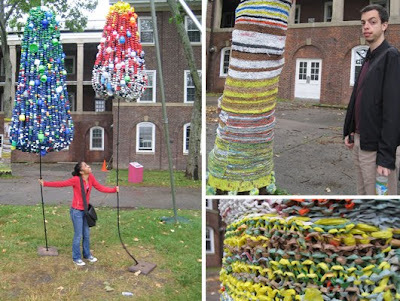 Other whimsical works of art included this bouncy/ hanging thing made from all sorts of bottle caps that rattled when pulled and tree cozies knitted from recycled plastic bags. I didn't think trees to shiver in the cold, but I guess they made for some pretty decoration. Also, one of the wonderful things about the event was being surrounded by so much music. There were jazz musicians, a DJ spinning house music and a live band all spread throughout the grounds. 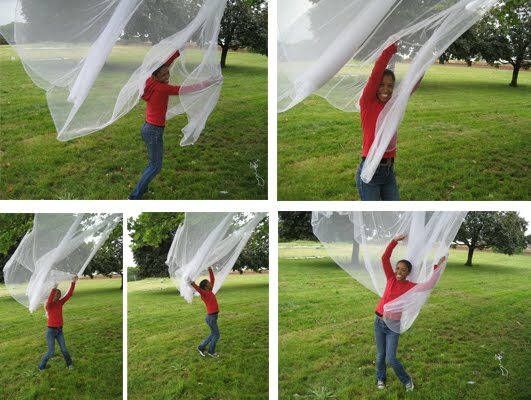 So when I saw a lonely mosquito net hanging from a tree, I just had to run through it and dance with the tulle flying in the breeze. "You're really letting it all out today, huh?" A. said when I finished acting a fool. Well when you grow up in Manhattan with insufficient grass, space and stress relief, you'd better take full advantage and release that pent-up energy the first chance you get before packing in the crazy and heading back home. So that's exactly what I did. On our music-filled ferry ride back to lower Manhattan, we marveled at how lucky we are to live in a place that makes events like this so accessible to us. A mere 10 minutes away from this concrete island lies 172 acres of nature, bike paths, historic monuments, a waterfront promenade and rolling hills with views of the city skyline, so close while at the same time feeling so distant. I love that I don't need a car or much money to escape for the day and forget about NYC for a while only to fall back in love with it as we approached home. If you want to take a quick trip around this year's FIGMENT, check out the video I pieced together for you. Just be warned: it contains silly dancing, bad singing and lots of laughter. Oh, and maybe a bit of teasing followed by an obscene gesture from A. Enjoy! Ooh! I love the bottle cap thingies. I would have been playing with all that stuff too. Sounds fun! Glad you were able to go and enjoy it all! So cool! Wish that would have been around when I was in New York a few weeks ago! It looks like you guys had a great time! You are so lucky to have so many ever changing things to do! Can not wait to be there. I need to text you so we can figure out a time to meet up! You and the green grass definitely get along.